Instead of writing a ‘normal' event review like I did last year (check out The Big Swing Night @ Leapin' Lindy 11), I thought I'm writing about this night from the perspective of the Swing DJ. Last weekend (February 8-10, 2012), the popular Lindy Hop weekend Leapin' Lindy 12 was happening in Switzerland's capital Berne. 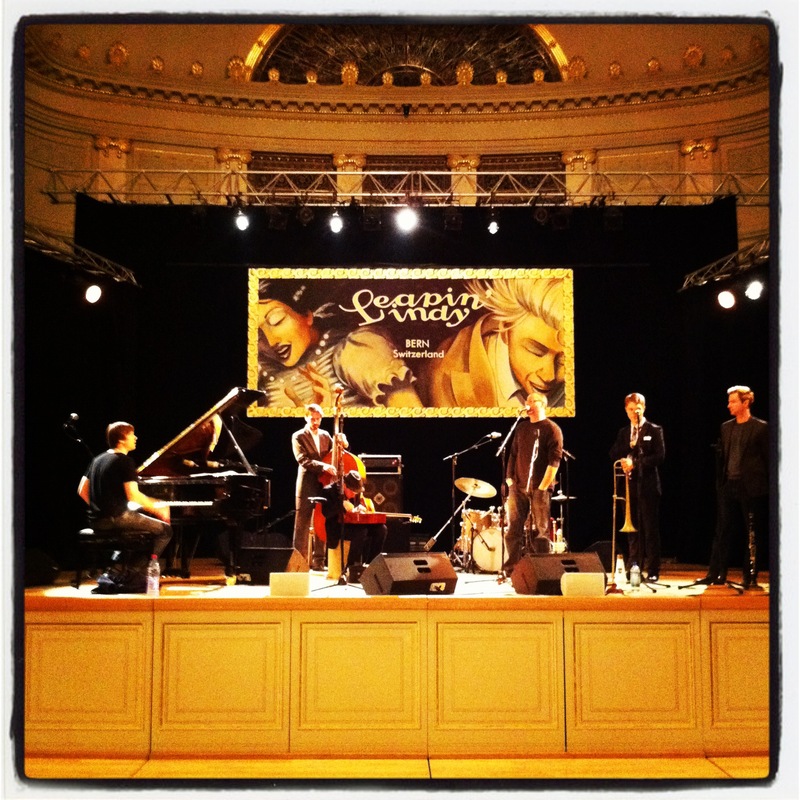 Currently, the Big Swing Night on Saturday is the biggest Swing Dance Party in Switzerland. The event started at 21h with a DJ set. The first band set was scheduled for 22h, but we waited another 15 minutes to have a nicely crowded floor. After the first band set of one hour, the presentation and social dance shows of the teachers took place. These were followed by a short DJ set and another band set. During the second band break, my task was to suddenly interrupt the party with a song that was going out of tune (thanks to DJAY) so that the MC Tim Collins could come up with a story to initiate a soul train cake walk. If you know Gordon Webster, then you know that the band is always playing longer than they are supposed to. Don't get me wrong, this is totally awesome, especially when you have such a great band in the city! Well, the party finished around 4h in the morning instead of 3h and eventually, I have DJ'ed more than three hours that night! He told me the story, that he was at a concert just a few days before, and after the last band set, while the audience was still applauding and asking for an encore, the DJ started a song. The audience was so upset, that they were booing the DJ. The DJ didn't take care of the band, because the applause is the reward for any performing artist! But he didn't also take care of the audience, because they didn't get a chance to ask for one or two more songs from the band. Choose songs which are in contrast to the band sets: different tempos, styles etc. Do not play the same titles as the band. There are always exceptions, though, e.g. when you choose a total different version. Give enough space to the band, that means don't start the DJ set too early, while the audience is still applauding. Wait for a sign of the band that they are really finished, or when the light technician is changing the spot to the DJ booth. A short rehearsal for the teacher shows was scheduled before the dance night, but it didn't happen. So the organizers and I didn't know what music the teachers will need for their shows. Either if I will have it on my laptop or if they will bring memory sticks, iPods etc. So I decided to plug the cables I brought with me into the mixer and prepare the sound settings: one for my laptop and two for iPods. That was a good choice, then I needed all of them and it was very easy and comfortable to switch between devices during the show. It was a big pleasure to me to be once again the DJ at The Big Swing Night and also an honor beside such a wonderful and energetic band like Gordon Webster's, which is in my eyes – and I repeat myself – the best live band for swing dancers you can have! The Big Swing Night @ Leapin’ Lindy ’11 Bern – What a great Night! I can't write about the entire Leapin' Lindy weekend because I only attended worked at the party on Saturday night. And this night was epic! I'm still delighted by the atmosphere and the energy in the beautiful ballroom of the Kultur-Casino in the middle of the city of Bern. The hosts of the evening were Eva and Nadja. They did a great job, brought in a lot of fun into their speeches and made the crowd ready for the band! 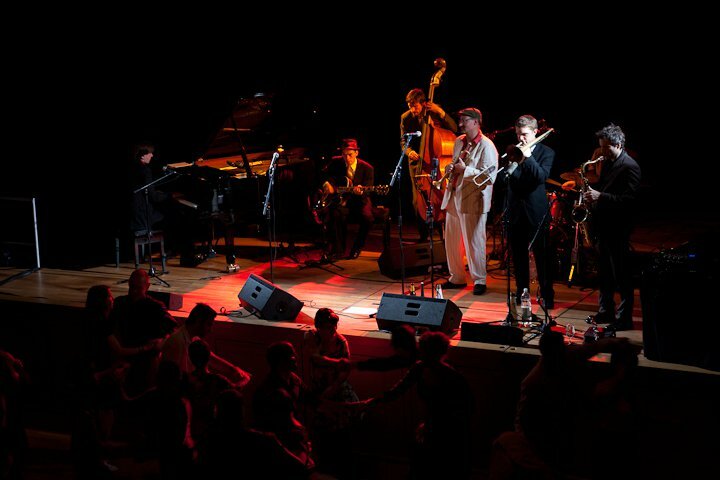 Thanks to its courage of the organising team to book Gordon Webster 7, we had one of the best contemporary swing bands in town and every minute was worth it! The band pushed the dancers and the dancers pushed the band – just the way it should be. Naomi Uyama, who was also in the teacher line-up, sang with the band and she was wonderful as well. One highlight was for sure the very last song, she sang a slow number only accompanied on piano by Gordon. The band was supposed to play three sets of 30 minutes but they were at least 45 minutes each. I was DJ'ing when the band not was playing so I can't tell you how good the DJ music was, you have to ask somebody else :-). A local teacher and good friend of mine was asking me, if it was difficult to DJ beside such a great band. Indeed, this is a very good question but honestly, I never was thinking about that. Like always at such events I try to feel the crowd and build my DJ set on the go. And of course, I tried not to play the same tunes than the band. There was one moment, during the last song by Naomi and Gordon I was mentioning before, when I asked myself what song shall I play NOW. I decided to play a complete different song and I guess it worked out. 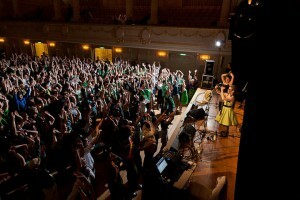 That was one of the best Swing dance nights in Switzerland I've ever been to! Period. This is one of the biggest events in Switzerland and I am really proud to be part of it! Come out and dance your shoes off! “One of the fantastic innovations at Leapin’ Lindy 2011 is the location of the Saturday night party. 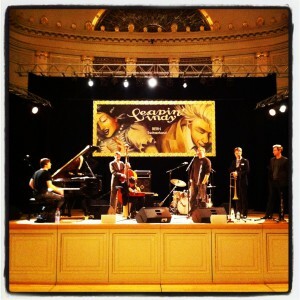 It will, for the first time, take place in the Kultur Casino Bern. The glamorous atmosphere of this historical building and the golden ballroom provide the perfect setting for an exhilarating party. While you float over the marble floors, we will take you on a journey through space and time. Imagine you are in the golden 20ies on board of a luxury cruise ship which is on its way from Dover, England, to New York City. The atmosphere on board is very relaxed as it is the last night on this ship before mooring in New York. For the last time, the captain invites his guests to the great ball, for the last time the jazz band will swing, and for the last time you prepare for an unforgettable night. The theme of the night is GREEN like the hope for all the new things that will await you at the end of the journey. You take something classy in green from your suitcase and join the crowd. In the ballroom, the couples move over the floor like green waves while in the lounge people refresh themselves with a gin or in an English manner with a cup of tea and biscuits. Breathe the air of adventure and let yourself be taken away, even if only for one night. We wish you a wonderful journey ! – or share or retweet this post. Thank you!